Wrought iron was used for armour plating from 1860 for HMS Warrior and later iron clads. Wrought iron could be manufactured in great slabs, and with consistent quality. Owing to its softness, however, wrought iron was easily penetrated, but the destructive effect was local. Steel, on the other hand, before the 1880s, was of variable quality, especially if made by the Bessemer process. Steel was very hard, and tended to break up the projectile and resist penetration to a much greater extent than wrought iron. However, the shock of impact was spread over a greater area. From experiments carried out by the Italians at Spezzia in 1876, it was concluded that, with a right-angled impact, steel has a much greater power of resistance to the attack of a large projectile than wrought iron, but if exposed to the continued fire from lighter guns the defences would be completely ruined. It shattered. As the power of guns increased, so to did the thickness of the wrought iron needed to resist the projectiles. By the early 1880s, it was believed that arranging armour as a sandwich would improve the resistance to gunfire. However, improvements in the manufacturing processes raised the quality of steel so that ships could be built with all-steel armour or wrought iron armour with a hard steel face. Compound armour is produced by welding a tough steel face onto a wrought iron backing, to achieve the advantages of both wrought iron and steel. The steel face, being excessively hard, breaks up the projectile or causes it to glance if struck obliquely, whilst the tough iron to which it is welded keeps the steel from the excessive cracking to which it is liable if used alone. 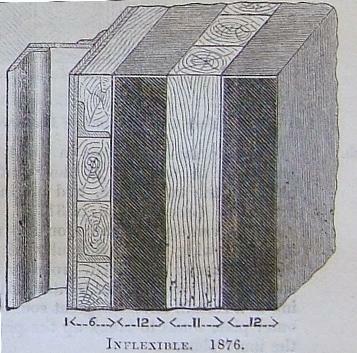 The chief difficulty in the manufacture of compound armour consists in achieving a perfect union between the surfaces of the iron and steel portions, blisters being frequently found to occur, and in the subsequent treatment of the plate by rolling. A procedure which suits wrought iron may not agree with such a different material as cast steel. Compound plates are made in two ways, patented respectively by Messrs. Ellis and Wilson. The iron back is made as an ordinary armour plate by rolling down three separate moulds (together 22 inches thick) to 16.5 inches. The steel front plate is made by rolling a hammered Bessemer steel ingot to a thickness of 3.25 inches. The front plate is secured to a steel frame attached to one face of the iron back, close to three of its edges, the distance left between the two faces being 4.5 inches. Into this cavity Bessemer steel is poured, filling it quite up. The entire mass is afterwards re-furnaced, and rolled down from 24 inches to 18 inches, thus making the iron in the finished plate about 12.2 inches and the steel 5.8 inches. A large wrought iron plate, built up of many thickness, is rolled, then placed vertically in a large iron box; liquid steel is then poured in between one side of the wrought iron and the side of the box, precautions being taken to prevent it flowing elsewhere. The plate is placed vertically so that the scum, etc. from rises to the top edge of the plate where it can be machined away, rather than to the face of the plate a would happen if the assembly were horizontal. The whole is then reduced in thickness by rolling. 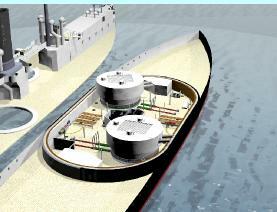 In both systems the steel is about one-third of the total thickness. Ellis's plan has the advantage of a good front surface, but it has in it two joins instead of one, as in the 'Wilson' system. Practically, the results attained seem to be about the same. 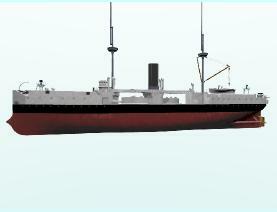 HMS Colossus was the first ship built for the Royal Navy that used Compound Armour for the main belt as well as turrets (Inflexible only had compound armour on the turret). In trials, it had been shown that compound armour was 25% more effective against forged armour piercing shell than wrought iron, in other words 12 inches of compound armour equalled the protection of 15 inches of wrought iron - a considerable saving in weight. The main citadel had 18 inches of compound armour on the beams, reducing to 14 inches below the waterline. It was slightly thinner at the forward and aft ends. Turrets had 14 inch compound armour, thickened to 16 inches at the turret front. The total weight of armour was 2,414 tons, a significant proportion of the total displacement for Colossus of 9,150 tons. 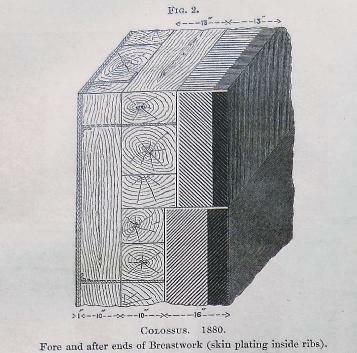 The backing of solid wood (teak) and metal frames was an important part of the armour scheme, since it was shown conclusively that the nature of the backing played a great part in the absorption of the impact of a projectile.